A suspension wasn't the only thing spawned by the Kurt Busch protective order ruling last week. Pit stall vandalism, regrettable tweets and even an IndyCar statement have been among the fallout from NASCAR's decision to suspend Kurt Busch indefinitely. Here's a rundown of everything you may have missed. Immediately following the suspension, the link to buy Kurt Busch gear from NASCAR's store redirected to the general page for Daytona 500 merchandise. Any link to Busch that would have been in the sidebar or elsewhere was taken off the site. Back at Daytona International Speedway, there was vandalism on Busch's pit garage immediately following the announcement that Busch had been suspended. 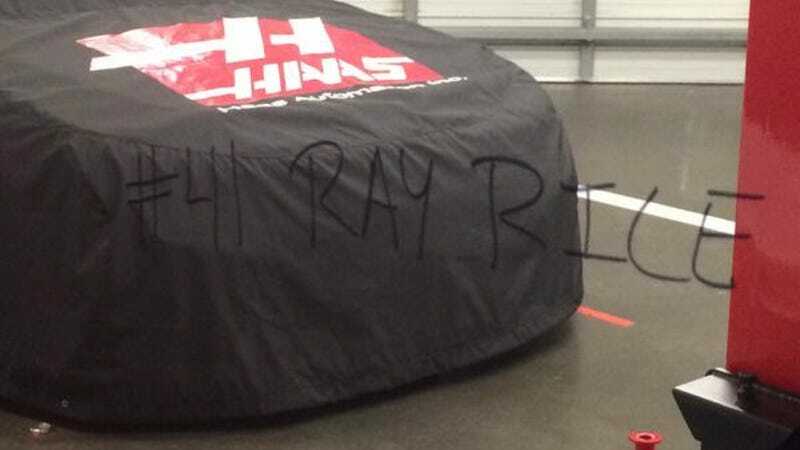 Someone had taken markers intended for autographs and put "#41 Ray Rice" on Busch's pit stall. Ray Rice refers to the Baltimore Ravens running back who was suspended immediately by the National Football League for punching out his then-fiancee in an elevator. The NFL's complete fumbling of the Rice incident has caused the NFL and many other sports, including NASCAR, to reevaluate how they handle domestic violence cases. Some see the Busch decision, which happened based on a civil ruling as opposed to a criminal conviction, as a reaction to the NFL's waffling on Rice. Fellow NASCAR driver Travis Kvapil, for example, pleaded guilty to domestic assault in January 2014, yet NASCAR took no action against him. According to Yahoo! Sports, NASCAR chairman Brian France stated last November that NASCAR would wait for criminal charges to be filed to take any action against Busch for the incident. That obviously changed with the additional findings that were released from the protection order hearings last Friday, as NASCAR felt they had sufficient evidence to act. It's clear that NASCAR wanted to avoid the damning response the NFL received for not acting on a video of Rice knocking out his fiancee. The comparison between the two cases was apt enough for one Daytona 500 attendee to write out on Busch's pit garage. No one knows who left the comment in Sharpie. Marco Andretti is clearly no fan of Busch ex-girlfriend Patricia Driscoll, although it's worth noting that there is some connection between the Andretti family and Kurt Busch. Busch competed last year with Marco on the Andretti Autosport team at the Indianpolis 500 and finished sixth, winning Rookie of the Year for his outstanding drive. Marco's father Michael Andretti owns Andretti Autosport. This tweet was deleted shortly after Marco posted it in response to one of Jenna Fryer's updates on the Delaware family court's release of additional details on the hearings. Wild guess here, totally out of left field: this sounds like something Andretti's sponsors do not want to hear the driver opine about. It's just, ah, a tad sensitive and controversial, that's all. IndyCar released a proactive statement regarding Busch's alleged domestic assault. Busch has yet to apply for membership in IndyCar, however, given his performance last year, they felt the need to comment. INDYCAR has not received an application for membership from Kurt Busch, and has no indication that he intends to apply. The series takes domestic violence very seriously, and its rules (including Rule 2.11.3) provide the basis of authority to address personal conduct. INDYCAR is monitoring this situation as it evolves. We will act firmly and strongly in responding to all matters of domestic violence. While they haven't outright banned Busch from participating there, they are saying what NASCAR originally said in regards to the situation: they're waiting and seeing what happens. Should Busch apply for membership there, I don't know if he'll get to drive this year. Despite its emotional tone, the petition currently has over 5,800 supporters, although, I'm not sure the "tyrants" at NASCAR will pay attention to well, something that calls them a bunch of tyrants. One thing is certain: NASCAR and other motorsport sanctioning bodies are a private entity, able to determine their own standards for taking action against a driver that differ from those used in courts of law. Will Busch be able to drive again? We're not sure. The court's findings had some doubts about Driscoll's testimony as well, but the evidence they cited to award her the protective order against Busch was fairly damning. Any potential criminal conviction will surely make matters worse for Busch. Chevrolet dropped their support of the driver almost immediately afterwards, which means that other sponsors are unlikely to pick him up. We don't even know if criminal charges will be filed against the driver yet. No further information has been released on the criminal side of the investigation into the incident between Busch and Driscoll at Dover International Speedway in September 2014. The Stewart-Haas Racing team appears to be taking the issue one week at a time. Yahoo! Sports reports that Regan Smith will substitute for Busch in the #41 Stewart-Haas Racing car for another week. Smith drove #41 to a sixteenth place finish at the Daytona 500, which wasn't bad for the tough superspeedway race. Smith finished 16th in the Daytona 500.